If you select to create synthetic full backups, you can additionally choose to transform a previous forward incremental backup chain into a reverse incremental backup chain. Veeam Backup & Replication will transform the latest backup chain consisting of the full (VBK) and incremental (VIB) backup files into reverse incremental backup files (VRB). The transform option lets you reduce the amount of space required to store backups. Instead of two full backup files — a regular full backup and synthetic full backup — you will have only one synthetic full backup file on disk. Note, however, that the transform operation takes more time than creating a periodic synthetic full backup. Veeam Backup & Replication always transforms the latest forward incremental backup chain (chain that consists of a full backup file and subsequent forward incremental backup files). For example, you have a backup chain that consists of one full backup file and set of incremental backup files. In the middle of the chain, you create an active full backup. When Veeam Backup & Replication runs the transform operation, Veeam Backup & Replication transforms the most recent active full backup file plus incremental backup files that follow it. All backup files that precede the active full backup file stay intact. The transform operation is accounted for as a backup repository task. Make sure you properly plan use of backup repository resources when you schedule backup jobs. 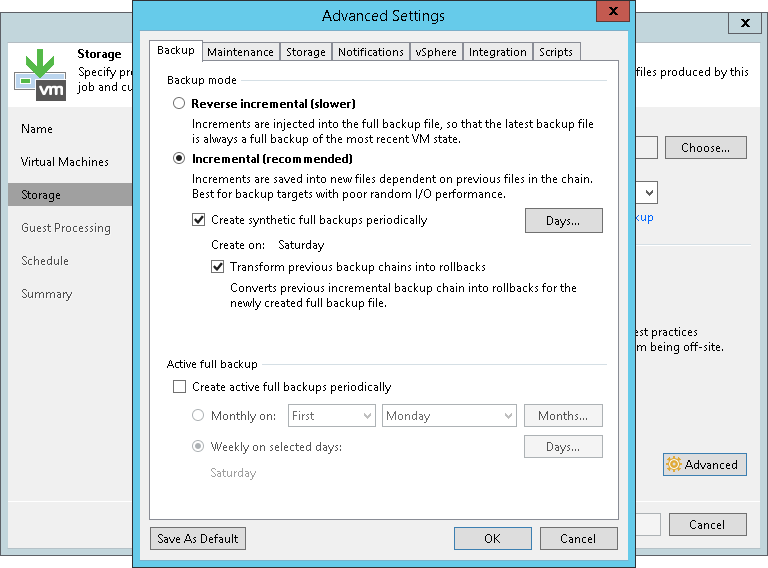 To transform the backup chain, you must enable the Transform previous backup chains into rollbacks option in the backup job settings. On Sunday, Veeam Backup & Replication creates a full backup file. 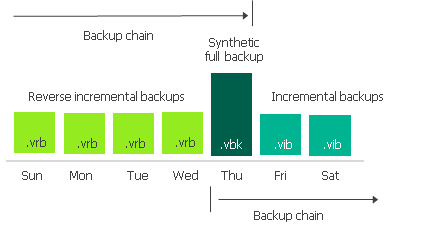 Monday through Wednesday, Veeam Backup & Replication creates increments and adds them to the backup chain. Veeam Backup & Replication injects the Monday increment into the Sunday full backup. Modified blocks are pulled out and saved as a reverse incremental file. As a result, you have Monday full backup and Sunday reverse increment. Veeam Backup & Replication repeats the process for Tuesday, Wednesday and Thursday increments. As a result, you have the synthetic full backup created on Thursday and a set of reverse increments for Sunday through Wednesday. When you run the backup job next time, Veeam Backup & Replication adds a new increment to the backup chain. The synthetic full backup will be used as a starting point. To maintain the necessary number of restore points in mixed backup chains (backup chains that contain reverse incremental and forward incremental backup files), Veeam Backup & Replication deletes an outdated reverse incremental backup file when the job adds a new forward incremental backup file to the chain.